Edit, 4/16/14: Post updated, see below! This is a modification of a map found here (ultimate source unknown). I’ve superimposed the American nations boundaries on it. 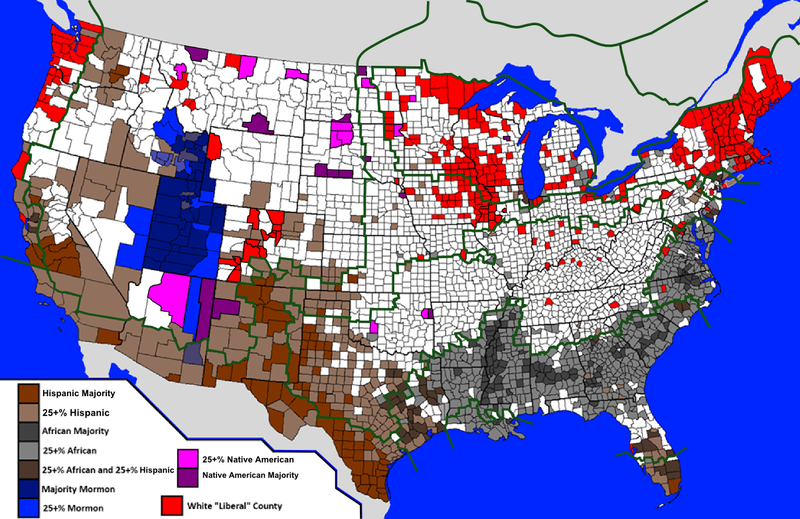 The white-colored counties on the map are overwhelmingly Republican voting White counties, but in some cases reflect counties with a mix of populations that don’t fit into the colored categories. As we’ve seen in my earlier post on the matter (Rural White Liberals – a Key to Understanding the Political Divide), significant regional differences in the White American vote exists. 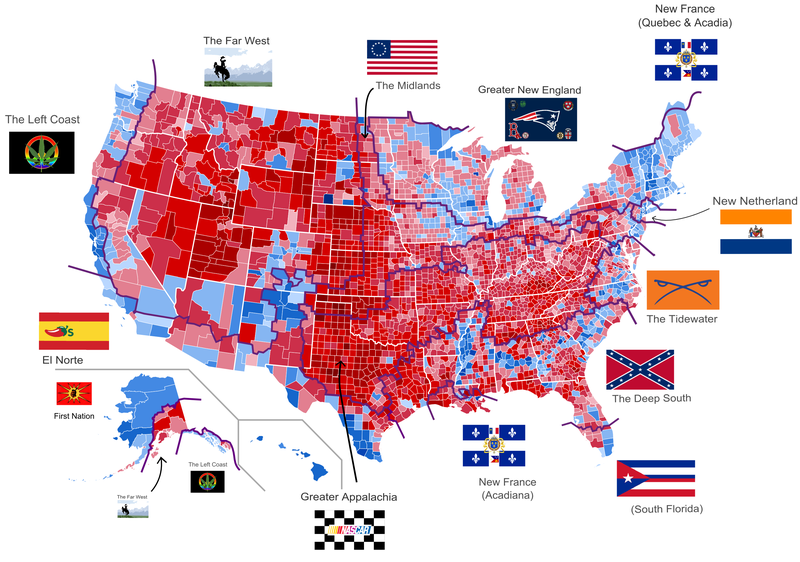 Particularly, there is a broad left-leaning area across Yankeedom (Greater New England), in parts of the Midlands, and along the Left Coast. 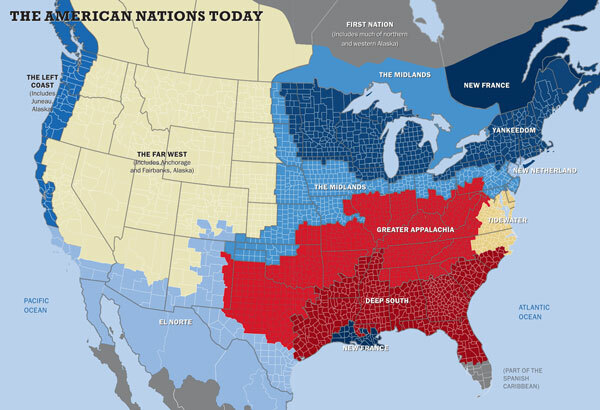 These reflect genetic differences as established by the founding (and immigrant) populations across these various regions (see aforementioned post). The ethnic composition of El Norte and south Florida is evident here. Racial composition also demonstrates part of the reason the Tidewater and the Far West are becoming national swing regions. In the latter case, the expansion of the Hispanic population is serving to turn key states in the area Democrat (additionally, there is a segment of liberal Whites colonizing Colorado). The legacy of slavery – the institution that was the backbone of the Tidewater and the Deep South – remains visible today as home to the primary concentrations of the country’s Black population. Is national (regional) pride what motivates Kanye West to embrace the ethnocultural symbol of the Deep South, the Confederate flag? As well, note that much of eastern Oklahoma contains significant Native American populations, however, they are not visible here because they are typically in the 10-20% range as a fraction of each county’s population. This is a map of the American nations superimposed upon a nighttime image of the U.S. Some interesting features become evident. One of the most striking is the orthogonal layout of the Midlands, patterned after its founding city, Philadelphia. This orthogonal layout follows a continuous band from southern New Jersey in the east running westward along Interstate 80 to where the Midlands unfolds in Iowa. The layout in Yankeedom follows a hierarchical structure following patterns of settlement radiating from the central hubs to their satellite cities and towns. In the Tidewater and Deep South, we see the haphazard settlement, resulting from interconnection of the formerly independent plantation steads. We can also see the abrupt “end” to civilization that occurs at the border of the Far West (which resumes on the Left Coast). 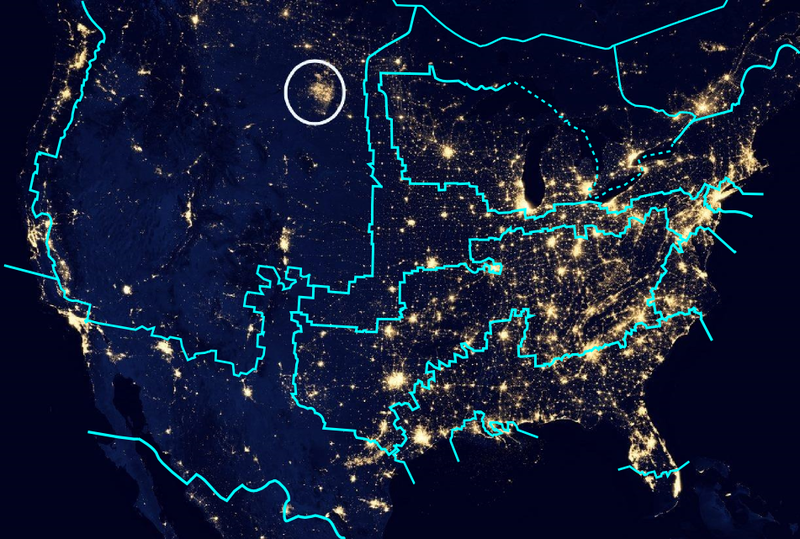 The circled lit up area in the Far West are gas flares from North Dakota’s fracking boom, a boom which continues the Far Western tradition of drawing settlers and transients seeking a living, and perhaps wealth, from the exploitation the region’s natural resources (and, additionally, of its people). The American nations remain alive and visible, and continue to underlie life and society across the continent. @Messi: I’m being partially facetious there. But, does West descend from Blacks who came to Chicago from the South during the Great Migrations? Woodard gets my home region wrong. The upper Midwest (Michigan, Wisconsin, Minnesota, Chicago, NE Ohio) doesn’t really fit in with Greater New England. There’s too much ethnic influence, and they haven’t really been assimilated into the Yankee model (though you could argue that the Ethnics in Boston haven’t really been either). It has more of the melting pot feel of the Midlands. The British-American ethnics that settled the area were Puritans, not Quakers. Think Little House on the Prairie. I think the German influence, which is dominant in Wisconsin and the surrounding areas, is probably responsible for the similarity with the Midlands. But yes, for that reason and a few others, it is quite different from eastern New England. Is “nation” the right word here? The “Deep South” is not a nation but a geographical entity. There are two distinct, significant nations that populate the Deep South. The other labels as well seem more like geographical rather than national labels since there has been and continues to be signification migration.